A certificate tells a small part of the story, but seeing a loose diamond in 40x superzoom lets you really get to know your diamond. Interact with your favorite loose diamonds in real-time together with our non-commissioned diamond and jewelry experts. They will call you to share their screen with you and walk you through the diamond attributes in superzoom magnification. Find your favorite loose diamond. 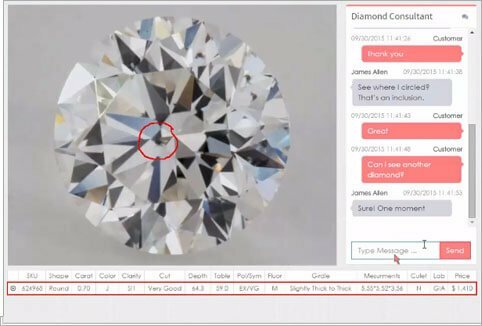 Click the Real-Time Diamond Inspection button. Interact with the diamond in real-time together with our non-commissioned diamond and jewelry experts, available 24/7. 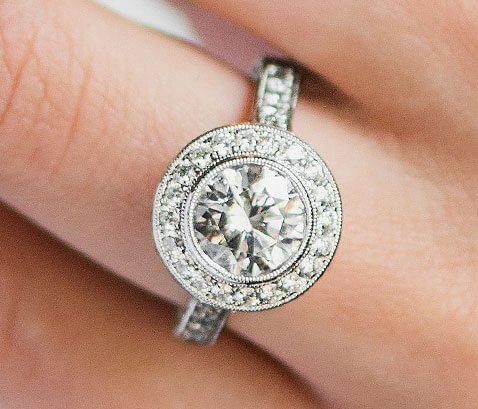 A stunningly beautiful diamond cut with long lines that give the stone an elegant and sophisticated look. The Marquise cut diamond is a boat-shaped brilliant stone, considered to be a “classic” choice for engagement rings. Fancy color yellow diamonds, or “canary diamonds,” range in shades from subtle cape colors to sunshiny fancy deep yellow. Romantic fancy pink diamonds are often adorned by celebrities, as they are known for their luxurious feel and incredibly rarity. Fancy color purple diamonds often have undertones of another color, the combination of colors adding to the charming diamond’s beauty. The rarest of all fancy color diamonds, red diamonds are perfect for the passion-seeker, evoking a deep intensity and power. Associated with royalty and wisdom and sought after by the elite, fancy blue diamonds vary from a faint teal-blue color to a deep blue color. Symbolizing new beginnings and growth, fancy green diamonds are adored by nature-lovers, closely connecting the wearer to nature. A happy stone which brings a carefree sense to its wearer, fancy color orange diamonds range in shades from light orange to fancy deep orange. Fancy brown diamonds are becoming increasingly popular, the champagne hues providing an elegant and classy feel to whoever adorns the stone. Although fancy black diamonds don’t sparkle like other fancy color diamonds, the shocking stone looks incredible on its brave wearer. Fancy grey diamonds come in varying shades, from pewter to graphite, and are perfect for the sophisticated, modern women. precious metal of your choice. Every loose diamond on JamesAllen.com is conflict-free and certified by one of the top 3 grading laboratories: GIA, AGS or IGI. The diamond certificates are displayed along with the loose diamond on our site. Our True Hearts™ Hearts and Arrows diamonds are the ultimate in perfect cut and symmetry - and have thus become a symbol of the purest expression of love. Every diamond from our True Hearts™ loose diamonds collection is an ideal-cut diamond perfect in its symmetry; a lasting masterpiece with superb color, dazzling clarity and exquisite shape. True to their name, the patterned reflection of hearts and arrows only appears when the diamond is of this absolute symmetry. The hearts are seen from the bottom of the diamond (the pointed side) and the arrows are seen from the top. Fancy color diamonds are a beautiful choice for those who want an alternative to the traditional "colorless" diamond. Choose a brilliant fancy color diamond in yellow, pink, purple red, blue, green, orange, brown, black or gray for a unique, colorful diamond engagement ring.